Maybe it's the piles of snow in our front yard or the fact that we can't even believe it's March to begin with, but wow Spring Break really snuck up on us. So here we are trying to figure out what the heck we're going to do, because Lord knows that cabin fever has set in for all 5 of us! Luckily, a quick little camping trip is an easy answer. Today we're talking about a GREAT app for planning your next camping trip! 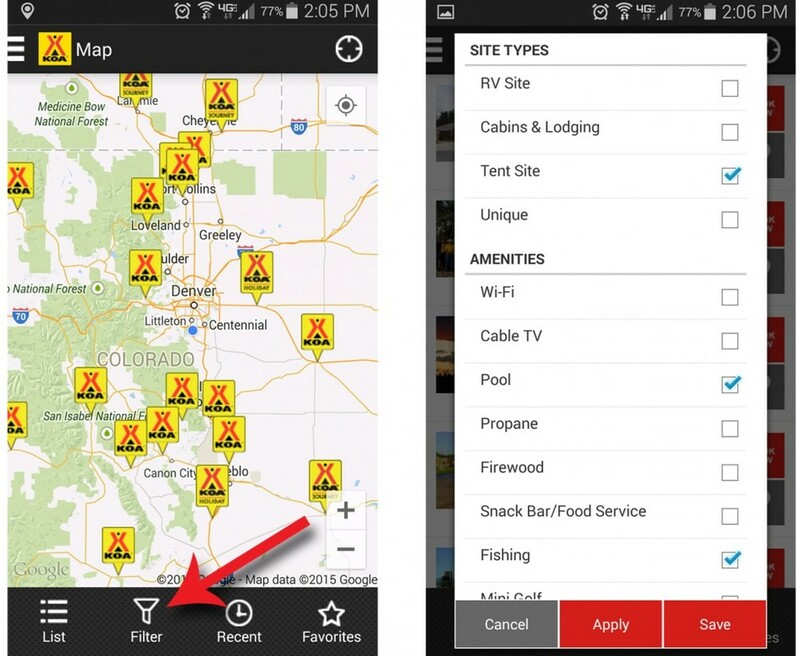 The KOA Camping App is FREE on Apple and Android devices (which we appreciate!) and although it seems basic, it has some nifty little features. Now, typically KOA's are our go to campgrounds - we take comfort in knowing there will be certain things we can rely on that fit our family. No, this isn't roughing it. Our kids love pools, playgrounds and pancakes and Mommy needs real toilets and showers. Luckily, at KOA's across the country, most of these things are standard. Especially the bathrooms! 1. SEARCH - When you open the app there are THREE ways to search for a campground - by name, by map, and by list. Search on the home screen or push the compass in the upper right hand corner for the app to find your current location. When we're planning a camping trip it's typically what is closest to us for quick trips or best situated to our final destination for longer trips. For this reason we love to use the map search - it's very easy to swipe and get to a new area (following highways or state lines) and the KOA locations just pop up as the screen moves. Another great search feature is the FILTER button - it's an easy way to find a specific campground for your equipment, kids, pets, amenities, etc. 2. CAMPGROUND - Once a campground catches your eye you can quickly find out nearly anything you need about the property including what's nearby and even the owners. A great feature is the FAVORITES star which you can click to have it remember campgrounds you like whether or not you've been there and loved it or it's on your bucket list. You can see the star rating from other travelers, browse pictures, and most importantly book your campsite!! 3. GETTING THERE - After you've booked your campsite and the car is loaded, the app can navigate you to the campground. Although this is great feature for the obvious task of getting to the campground, we also like to use it for planning our trip - seeing how far in time and miles it is to get there. 4. VKR - If you're a regular to KOA you already have or know about the VKR card. This app will store all of your VKR information and keep your preferred booking info ready to use. 5. NOTIFICATIONS - This feature is fantastic for campgrounds you have already booked or that you have remembered as a favorite. It will let you know information on events, camping deals and even emergency updates on an upcoming stay through push notifications. All in all, this app replaces the KOA Directory for us. It saves paper and answers all the same questions as other online planning. Because we love clarity we want you to know this post was not sponsored in any way by KOA. This is simply just our opinion and we like to share awesome stuff. But hey, KOA, if you ever need us just let us know! Where is your favorite KOA?